Legitimate art forms today such as abstract art; tattoos; computer-generated art; shock-value art; graffiti are often just “surface art”. Art mimics the sign of the times we currently live in. A comparison would be like the line on an EKG that goes straight when there is no life left. We have leveled the “playing field” with art that is mostly surface and no depth. Our very culture has become “surface”. Mitch Albom, a noted author and radio personality in the Detroit area was at the Church of the Holy Sepulchre in Jerusalem believed to be where Christ was crucified. Mick Jagger walked in and people were more interested in photographing Mick rather than be in awe of the area they came to visit. Art creations can have beautiful colors, designs and clever juxtapositions but where is the depth of meaning? My question is: Where is art going to go in the future? It is rather obvious that art will evolve somewhere, usually the opposite of what is current today. Sooner or later depth of meaning will come back into play. Art will once again say something beyond a glossy cover. 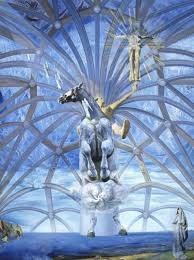 An example of in-depth art is attached - Salvador Dali’s “Santiago El Grande”.